The past several weeks have seen the discovery of a surprising number of remnants left over from the Second World War. 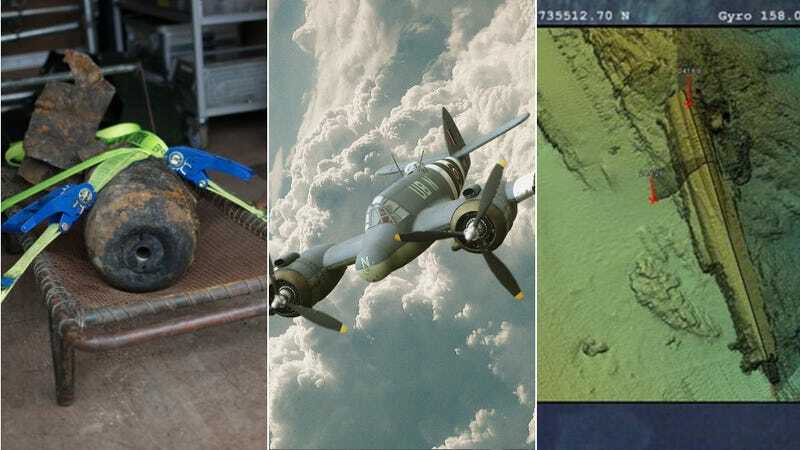 The latest finds include a sunken Nazi sub off the coast of Norway, the re-discovered remains of a Bristol Beaufighter Mk X in Italy — and an unexploded 200 lb bomb in Germany. Indeed, after a conflict that killed nearly 70 million people, it hardly comes as a surprise that there’s still so much junk left over. But like the recent incident in Germany has shown, the lingering threats from the war are still very real. The bomb was discovered less than 20 feet from a train track near Berlin’s main station. Some 840 people had to be evacuated from central Berlin and nearby schools and hotels shut down. German authorities had to put planes into a holding pattern above the city as a bomb squad worked to defuse the Soviet-made device. Unlike the Munich explosion, Wednesday's incident was "a totally normal defusing," Berlin bomb squad head Dietmar Puepke told reporters at the scene. Puepke has had a lot of practice, and experts predict he and other bomb disposal experts will get a lot more in the years to come. In the German capital, 2,000 bombs have been recovered since the end of the war. And experts say between 2,000 and 4,000 tons of explosive material—including unexploded hand grenades used during the fierce battle for the capital in 1945—still litter Berlin. "They find and defuse 10 or 15 bombs each year," said Wolfgang Spyra, former head of the Berlin Police Department's Forensic Science and Engineering Department and a retired professor at Brandenburg Technical University in Cottbus. "At that rate, you can imagine how much longer the problem will be with us." The number of bombs still to be found is staggering. British, American, and Russian bombing raids dumped upward of 2.7 million tons of bombs on Germany during the war, each weighing anywhere from 100 to 4,000 pounds (45 to 1,814 kilos). Spyra estimates between 7 and 15 percent of those were duds, bombs that hit the ground but failed to explode. For decades, they've remained live, waiting quietly for an errant backhoe or bulldozer to set them off. As an aside, the Pentagon has created a database of every bomb they’ve dropped since World War I. Meanwhile in Italy, a group of amateur archaeologists recently rediscovered the remains of a British aircraft dubbed “Whispering Death” by the Japanese. It was renowned for the speed at which it could suddenly appear and strike. The two-engine plane crashed on September 6, 1944, killing Flight Sergeant John Horsford and Warrant Officer John Watson. Consisting of parts of the fuselage and the propeller, the remains were actually found years ago in the small village of Gusano, in the Apennines mountains south of Piacenza, by aviation war enthusiast Francesco Lazzarelli. Nearly forgotten, they were recently rediscovered by another amateur researcher, Cristiano Maggi. “Such remains are quite rare. Usually we find only small pieces of war planes as the wreckages were often recycled by the population to make tools,” Maggi told Discovery News. With the help of another group, the Air Crash Po wreck hunters from Cremona, Maggi and his team were able to identify the remains as belonging to a British night fighter plane, a Bristol Beaufighter Mk X. On a related note, the attempt to find buried Spitfires in Burma appears to be a lost cause. Are there perfectly preserved WWII-era Spitfire airplanes buried in the Burmese jungle? And lastly, the wreck of Nazi U-486 submarine was recently discovered off Norway’s coast during work on an oil pipe. The U-boat was torpedoed and broken into two by a British submarine in April 1945, killing all 48 people on board. The U-486, which now rests at a depth of 250 meters (820 feet), had just left the western Norwegian town of Bergen when it was hit. Interestingly, the U-486 had a special synthetic rubber coating on the hull designed to significantly reduce its radar signal. Which in this case didn’t really seem to help (unless it was visually spotted). Subs have also been found close to the United States and Canada. Just last July, a sunken Nazi U-550 was found just off the coast of Nantucket. Images: AFP, Imperial War Museums via Discovery News, NOS.nl; top Beaufort via.